Getting a pedestal for your statuary or sculpture is one of the most important things you can do to bring out your piece of art. From the garden to inside your home. The pedestal makes stand out and all alone as a unique piece of art. In the garden pedestals are perfect for urns and planters. When finished alike the two become one unit and make quite an attraction for your garden plants. We also carry several indoor pedestals that make your sculptures and statues stand out. Again that pedestal ties together with the sculpture and emphasizing the beauty of the piece, by separating it from its surroundings a statue or sculpture put on a table or counter has a different look than those standing on a pedestal. Are pedestals are made from durable fiberglass and fiber stone. The fiber stone has a rustic look as perfect for the outdoor garden or patio. It can get wet and withstand the outdoor weather year round. Many of our fiber stone pedestals have a rustic look that is because they put sand and rocks in the mix when the piece is being made. This gives the fiber stone pedestal a weathered look and a look of great age. We also carry the fiberglass pedestals these two are able to go outside in year-round weather. There also perfect for indoors as they are smooth and clean looking. Pedestals come in all shapes and sizes. Please browse through our wonderful selection of pedestals for statues. 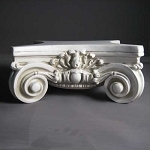 We have a large selection of art display pedestals and Greek column pedestals. Pedestals are a great way to display that sculpture or statue. The nice thing about pedestals is that is raises your statue or planter up to eye level. So you can enjoy the piece more and makes tending plants much easier on the back. They also look great displayed at different heights. Weather its an ornate pedestal or an old rustic garden style one. I'm sure you will find one here that will suite your needs. We also have a nice selection of Church pedestals and large surface pedestals that are great for commercial use like trade shows. We also carry long Greek and Roman columns. That are perfect for setting an outdoor atmosphere for a patio area. We also have fragmented columns and capitals that can help with the surrounding ground area to make a Greek or Roman ruins effect. Pedestals can also be used on porches and patios as and end table as they will fit into tight spaces and are handy for that glass of Beer Wine. Some pedestals have a large enough surface area they can hold a glass top. The other thing you can do is use two pedestals with a rectangular glass top. This makes for a an excellent patio table. They will not rot or break due to the weather. Are pedestals are a true fiberglass product, that is the product has fiberglass reinforcing the pedestal. That is where the pedestal gets all the strength is from the reinforcing glass material. This is an important when it comes to strength and outdoor use in the garden or patio area. Please see our Fiberglass and Fiber Stone page. This type of fiberglass will with stand the outdoor year around weather. They will also easily hold 200 lbs (If you saw the video above). This is the same kind of material boats and cars are made out of today. There are lightweight and strong. The pedestals can also be ordered with open or closed bottoms if you want to put them outside on the ground, with close bottom. They can be ordered with bottoms open for indoor use on a carpeted surface. With the bottoms open they have better stability on carpeted surfaces. Also if used outdoors the open pedestal can be put over the top of the 4 x 4 post to give it greater stability or for mounting purposes. Another type of pedestal we have is our lighted floor pedestals and lighted table top pedestals These are made by us and can be custom built. We also have ready made ones in our lighted pedestal category. Our light pedestals are meant for indoor use only. A huge selection of laminate colors are available on custom built orders. A light source on the sculpture or art piece can dramatically affect the look and feel of the piece. Instead of having that table lamp on you could have that special piece lit up from below. Giving your room that special feeling. We also make rotating pedestals that are motorized and manual turn lighted pedestals. These pedestals are made by us and are not mass-produced. Pedestals are made of the highest quality materials. All joints are either dadoes or rabbit joints, nailed and glued. We also make boxing cube pedestals without the light. These can be custom finished or laminated to a specific color or pattern. You can see our lighted “lighted pedestals” here. Choosing the right pedestal for a statue can sometimes be difficult. As you often acquire the pieces separately. You want to join to together so that they are in harmony and look proportionately correct. 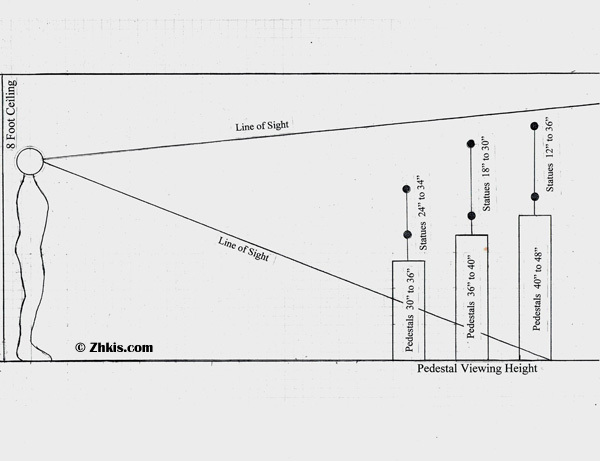 This Diagram shows a persons line of sight from at a distance of ten feet. This diagram is also drawn to scale based on a person 6 feet tall. So you can get a visual idea for proportionate statue height.We have put together a visual display of various statues and pedestals. So you can get an idea of the proportionate size of pedestal height to statue height. Below are some photos to help you visually gauge, different size statues with different pedestal Heights. Pedestal Heights seem to get smaller when taller pieces are placed on them. Please see the photo references below. This pedestal is shown here with three separate pieces of different heights. This is the same pedestal in all three pictures. It's amazing that when you set a piece on a pedestal like this one, the height of the pedestal seems to change visually. The first picture has a red metallic vase that is 12 inches tall, sitting on a white pedestal that is 41 inches tall. The base is almost too small but still works proportionately as that smaller piece as that lifted up to eye level for better viewing. The next piece is a remnant head of a gladiator. The gladiator head is 19 inches tall it is almost half the height of the pedestal it works very well here proportionately. However when you view these two pieces together, the piece does not look like it's half the height of the pedestal. When the piece is placed on a pedestal such as this the pedestal seems to shrink in height visually. The last piece in this group is Venus statue that is 34 inches tall. She is almost too tall for this pedestal proportionately. She would look better if she was on a pedestal about 6 inches lower. Again the Venus statues height affects the look of the pedestal. She is over half the height, actually more about three fourths the height of the pedestal. But she does not look that way sitting on top of the pedestal she looks less than half. This silver diamond pedestal is 25 inches tall the Venus statue that sits on it is 34 inches tall. This is proportionately pleasing the larger piece of a shorter pedestal looks good. The middle photo shows a copper vase with a sun on it. The vase is 19 inches tall and is just a little too tall to be proportionately correct. This vase would have to come down another 6 to 12 inches to look proportionately correct. Our silver diamond pedestal that is 25 inches tall has a Buddha sitting on it that is 18 inches tall. Proportionately this looks good. The top platform of the pedestal could be a bit wider but still works for this piece. Here is pedestal a ionic pedestal that has one of our lovers statues on it. This pedestal with the granite finish is 29 inches tall, the lover statue is 21 inches tall. This is a good match proportionately for this pedestal. Again with this next piece the pedestal seems to shrink in height. It is still 29 inches tall but the clock that is 31 inches tall makes a pedestal sink shorter and does not work with this combination. This last photo is our 29 inch granite pedestal that has a contemporary lovers statue, that is 12 inches tall. In this case the piece is too small for the pedestal in the pedestal dominates too much and a statue or art piece is diminished. So in this case a statue of 18 inches to about 24 inches would be perfect for this 29 inch tall pedestal. This gargoyle is given some height by this pedestal that is 39 inches high. The gargoyle is 24 inches tall it seems to work with this piece. Yet the gargoyle were much taller it would need a shorter pedestal. A classical Venus statue stands on a Doric Greek style pedestal and is almost perfect in height and proportion. The pedestal she stands on is 19 inches in the Venus statue is 34 inches tall. Getting a taller piece like this one or two of short pedestal is much better. This vase is 12 inches sitting on our granite pedestal that is 29 inches. Again here this vase is too short the height of this pedestal another 6 inches tall would help with his proportions.